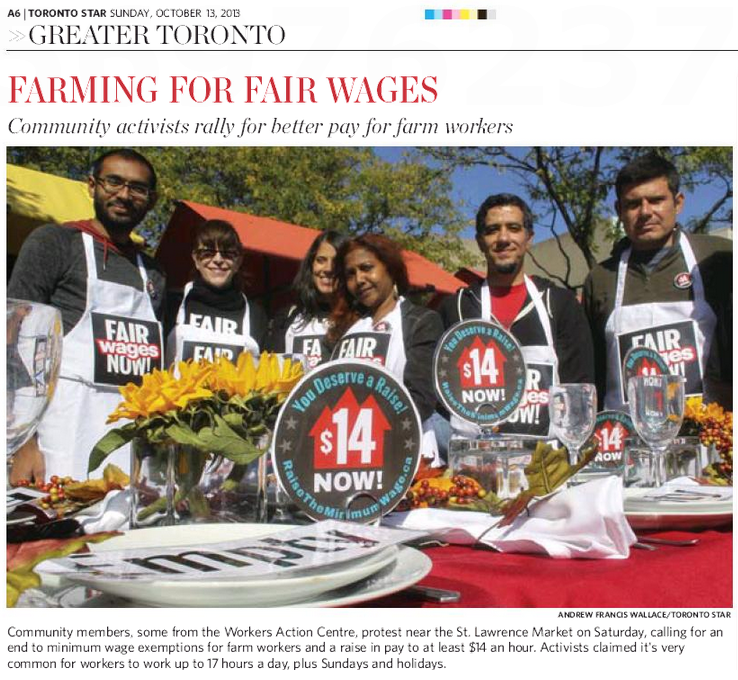 Join us on Saturday October 12th at 1030, as the Campaign to Raise the Minimum Wage, in collaboration with the Migrant Workers Alliance for Change, hosts a Feast for Fairness at Toronto’s St. Lawrence Market (Meet at the corner of Front St. E and Jarvis. (1 block south of King St. E) Toronto), calling for an increase in minimum wage and the inclusion of migrant workers into minimum wage laws. This Thanksgiving weekend, many low-wage workers are resorting to food banks in order to get by; and restaurant workers continue to see their wages stagnate. Many migrant workers are excluded from minimum wage laws altogether. Join us as we demand an immediate increase to the minimum wage to $14 and ending minimum wage exemptions for all workers! Migrant Workers Alliance for Change and our member organizations Justice for Migrant Workers, Migrante Ontario, Parkdale Community Legal Services, Social Planning Toronto, Unifor and Workers Action Centre presented to the Ontario Minimum Wage Panel on Friday, September 6th. We at MWAC fully support calls to increase minimum wage to $14/hour and to be tied to the rate of inflation. At $10.25, the minimum wage forces workers below the poverty line. We support the position of the Campaign to Raise the Minimum Wage that the minimum wage should be set 10% above the poverty line, using the Low Income Measure and assuming a 35-hour work week. Furthermore, the minimum wage should be updated every year with the cost of living. (1) Ontarians in the agriculture industry including those deemed migrant workers are excluded from Ontario’s minimum wage laws. This is fundamentally unfair and unjust. All minimum wage exemptions in the Employment Standards Act must be removed. (2) Many Ontarians that are denied full immigration status by the federal government face legal obstacles that make it impossible for them to assert their right to minimum wage. 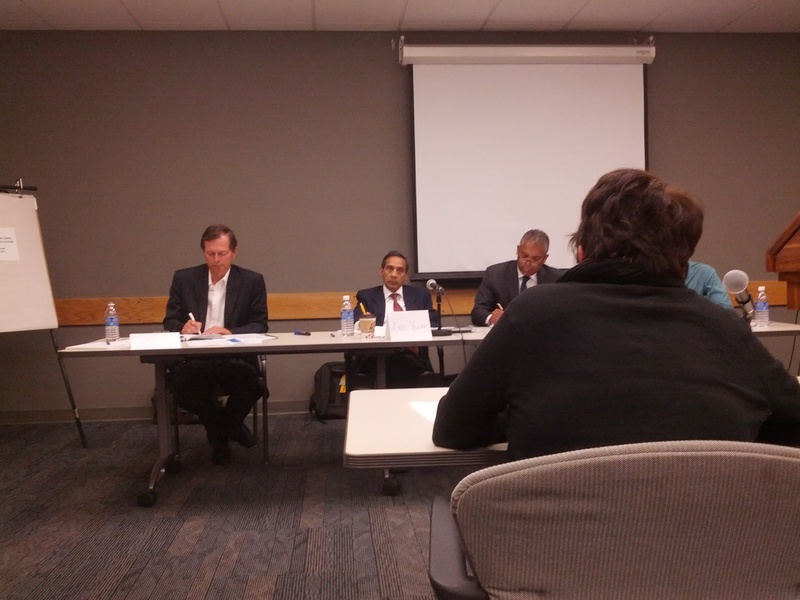 In our experience, a great number of workers are being denied minimum wage or overtime pay. Specific anti-reprisal laws must be developed and these legal obstacles removed. (3) Ontario currently does not track employers and recruiter of Ontarians deemed migrant workers and therefore has little enforcement capacity. All employers and recruiters in Ontario must be registered, must be forced to put up lines of credit, and must be held jointly and severally liable for any violations. Read our full oral submission here. Equal Pay for Equal Work! Call for Action. Rally against migrant worker wage cuts! The Conservative government has given employers in Canada more rein to exploit migrants. Employers can now pay migrant workers 15% below the average wage. This is an outrage! To discriminate on wages simply on the basis of nationality is unfair. Considering that most migrant workers are people of colour, this wage cut is simply racist. The Migrant Workers Alliance for Change, a community-labour alliance of over 40 organizations, will be demonstrating at MP Joe Oliver (Cabinet Minister for Toronto)’s office on May 24th. We are also calling for pickets and demonstrations at Conservative MP offices across Ontario on Thursday, May 24, 2012. If you can organize an action at ANY Tory MP office, please get in touch. Here are some locations we have identified where the Conservatives are susceptible to pressure. Can you help organize an action in your community either at these offices or another one? If so, please email mwalliance4change@gmail.com by Monday, May 21, 2012. We can provide call-outs, draft press releases as well as support for visuals. – A RIGHT TO FULL PROTECTION UNDER THE PROVINCIAL EMPLOYMENT STANDARDS ACT AND REGULATIONS currently enjoyed by Canadian Citizens and Permanent Residents, including NO FEES for any work placement. – Immediately implement a NATIONAL REGULARIZATION PROGRAM granting permanent immigration status for all non-residents living in Canada. Toronto – The Migrant Workers Alliance for Change, an alliance of migrant workers, labour unions and community organizations denounces the latest Tory “jobs-strategy”, paying migrant workers 15% less than Canadian citizens. Formed in April 2009, the Migrant Workers Alliance for Change (formerly the Coalition for Change) is comprised of various advocacy and community groups, unions, workers and community members, aimed at improving working conditions and fighting for better protections for live-in caregivers, seasonal agricultural workers and other temporary foreign workers.